The official Notification for CLAT 2018 has been released by The National University of Advanced Legal Studies (NUALS) Kochi on December 20, 2017. As per the official CLAT Notification, the CLAT Entrance Exam will be held on May 13, 2018. 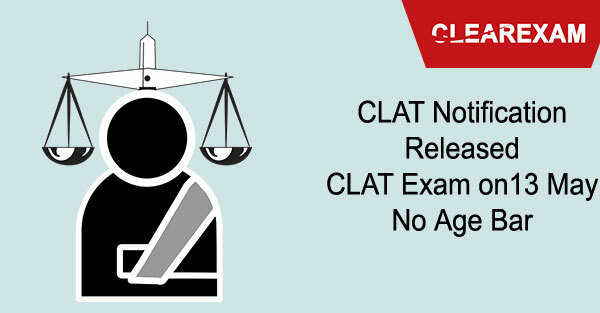 In the Notification, there is no mention of age bar to appear in the CLAT Entrance Exam. As per the CLAT 2018 Notification, the CLAT Exam will be held on May 13, 2018. Along with the CLAT Exam, other important dates have also been announced. Candidates can fill the CLAT Application Form 2018 from January 1, 2018, till March 31, 2018. The 3 months time is given to the Law aspirants to duly filled - in the CLAT Application Form after paying the CLAT Application Fees. Similarly, CLAT Admit Card will be available to download on the official website from April 20, 2018 and the CLAT Result will be announced on May 31, 2018. The complete CLAT Calendar has been updated by the NUALS. In CLAT 2018 Notification, few changes have been introduced. As the CLAT 2018 is going to be the tenth year in a row, some changes have been administered for the sake of better administration. As in 2018, a new Maharashtra National Law University, Aurangabad is added to the list of NLU's. Hence, with the addition of one more NLU, the seats available for admissions have increased and a significantly higher number of law aspirants are expected to appear for the national-level law exam this year. Secondly, there is no age bar for the Law Aspirants. The CLAT 2018 Notification doesn't mention any information about the age for Law aspirants. Unlike last year, when the Bar Council of India (BCI) had introduced an age bar policy on Law admissions and restricted candidates above 20 years of age to appear in CLAT Exam. But, Supreme Court's stay order on BCI's age bar policy has given the NUALS freedom to exempt age bar and allowed all the law aspirants to appear for CLAT irrespective of their age. CLAT 2018 Notification has been released. Check all the latest updates on CLAT Exam.